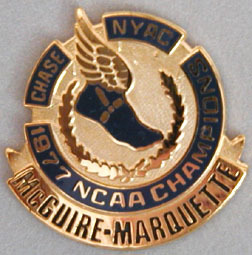 A limited edition pin made in 1997 celebrating the 20th anniversary of Marquette's and McGuire's improbably run to the National Championship. Commissioned by Chase and made by Balfour, this pin was given out with the Lute Olson-Arizona pin at a New York Athletic Club dinner. Only 300 numbered pins produced.